Essential for tonkatsu but also a good time filler for ADD kids like me, hehe. 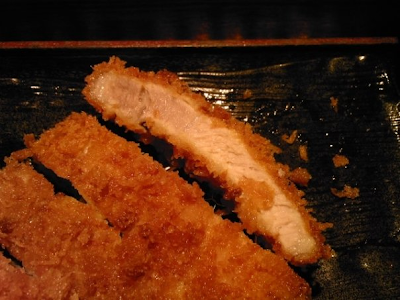 I ordered the thinner pork cutlet that, as a general rule, I don't like as much (I prefer the juicier and tender fillet), but K had ordered a set that already had pork fillet, so in the spirit of eating as widely as my waistline, I ordered the more traditional cutlet. Now, I don't know if this photo's good enough, but it was in fact reasonably juicy - more so than my fillet (thicker and supposedly more tender than a cutlet) at Tonkichi (see previous post). However from the closeup you can also tell that the crust was less well-formed than the one at Tonkichi - thinner, oily in parts with 'bald' patches and hence a less even colour. It's not fabulous, but its convenience and lower price point means I'll be coming here more often than Tonkichi (and Tonkichi wasn't that great anyway). Now, all this tonkatsu talk reminds me that I have a huge backlog from my Christmas Tokyo trip. 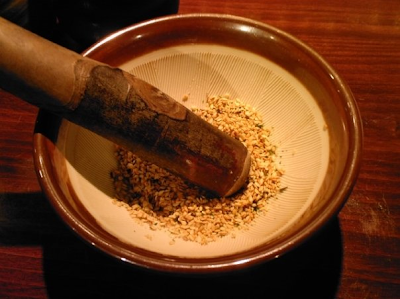 The rest will have to wait, but allow me to tag on a little about Maisen. 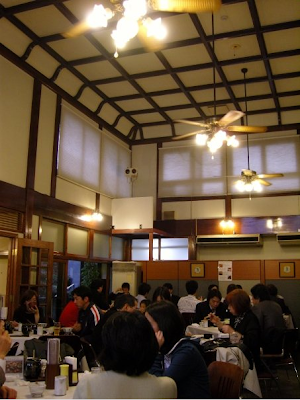 This tonkatsu stalwart is famed both locally and abroad, and personally I think this is in part due to the unique building it's housed in - a beautiful old bathhouse. 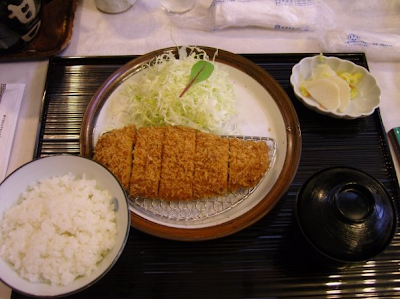 I ordered their cheapest tonkatsu set even though there were options to 'upgrade' to kurobuta pork because I wanted to see how well they served their 'economy class' clientele, and plus, everyone else on my table ordered kurobuta so I knew I could steal some hehe... I found the pork a bit dry and maybe too lean - there was a bit more fat towards the tip (last piece on the right), but otherwise it was very well done - the crust, like Tonkichi's, was a perfect gold, crumbs evenly distributed. 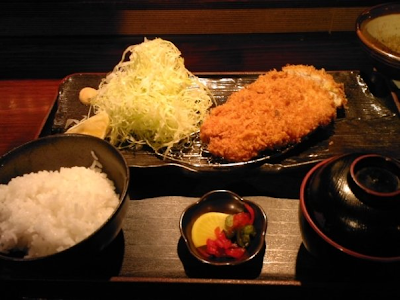 As for the kurobuta, it was indeed a little fattier, making the cutlet much juicier and tenderer. Well, they've got to make the upgrade worth it I guess.